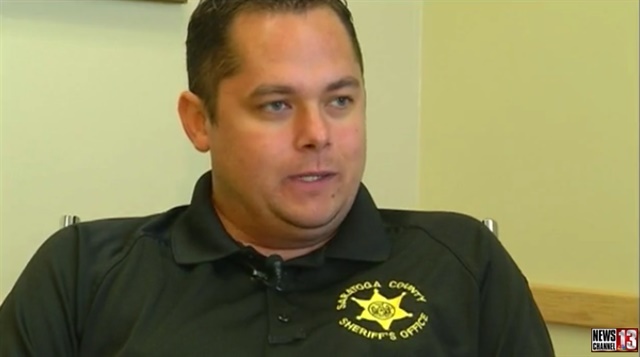 Deputy Andrew Gravelle of the Saratoga County (NY) Sheriff's Office, who is fighting cancer, is urging people to donate blood to help people like him who may need blood transfusions, reports WNYT. Gravelle, 33, loves to run, often ultra-marathon distances of 50 miles. However, he was recently diagnosed with cancer and has a lesion on this spine that has caused him to be paralyzed from the chest down. He has undergone surgery and his current treatment includes physical therapy and chemotherapy. So far, he has not needed a blood transfusion, but he worries that will change if his cancer progresses and a bone marrow transplant is necessary. His years as a sheriff's deputy, responding to calls involving severely injured people, makes him acutely aware of what a lifesaver donated blood can be. That's why he encourages everyone to donate blood so it is available when crisis strikes. "You never know when something's going to happen. I'm 33 years old. You think I was just going to wake up and realize I had cancer in my back? It's something to think about," Gravelle says. "It takes five minutes out of your day to go and give blood." Gravelle hopes to be running again by next year.